This scene is in the high country at the head waters of the Khutzeymateen Valley. 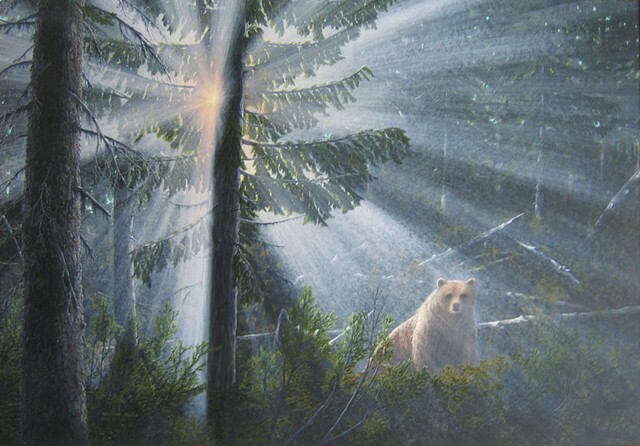 I created the painting from photos of filtered sunlight in the Khutzeymateen forest and from bear photos. When I'm hiking in the woods, my senses are alert for any movement or branches snapping. Meeting a large grizzly observing you as I have shown is an adrenaline rush for longer than what is comfortable. In this painting, I attempted to make the eyes show a pleasant, almost sad look.